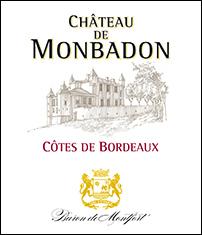 The feudal Château de Monbadon, built in the 14th century, can be found at Monbadon-Puisseguin, 40 kilometers from Bordeaux. Most of the vineyard of 25 hectares (of which 20 currently on production) is located on a clay and limestone plateau with a ferruginous subsoil, at the altitude of 109 meters above see level, very close to one of the two highest points of Gironde : 114 meters. The rest of the vines lies in steep hill at the feet of the castle. This aromatic and complex wine will be perfect with red meats and cheeses.